Elephant’s ear, also known as taro, dasheen and malanga, is a member of the Araceae (Arums) family of plants and is a Hawaiian native. The scientific name is Colocasia Esculenta. Elephant’s ear is very similar to caladium except that it is a much larger plant (ten times larger) and its leaves are primarily green with wavy edges although there are some variegated varieties. Elephant’s ears grow from large tubers which produce corms. Their corms weigh an average of one to two pounds each but can be as heavy as eight pounds. They are herbaceous perennials that can grow to a massive eight feet high and equally as wide. Each of the elephant’s ears green leaves can grow to be five feet in length and up to three feet wide. Being a tropical plant it is only considered hardy in zone 10 on the USDA Plant Hardiness Zone Map but can be grown anywhere there is a hot summer growing season. They can be treated as an annual or lifted from the ground before freezing temperatures set in and saved for use the following year. Elephant’s ear is prized for its beautiful tremendous leaves and usually only produces its white flower during the summer when planted in some tropical areas. Plant elephant’s ear corms, blunt end down, in humus-rich, moist soil in a spot where they will receive light shade after all danger of frost has passed in your area in the early spring. In northerly climates they should be planted in full sun. They can survive in full sun anywhere if they are watered heavily during the growing period.. Be sure to cover your corms with at least 4 inches of soil over their heads. 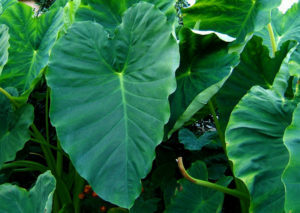 Elephant’s ear thrives in a swampy tropical environment and like to be kept moist throughout the growing season. The warmer the temperature, the faster your elephant’s ear will grow. Feed them with a light fertilizer (6-6-6) every two weeks during the growing season. Contact us today!